Sleeve-Aide™ Jacket and Sportcoat Dressing Aid keeps shirt sleeves in place while you put on a jacket or sweater. 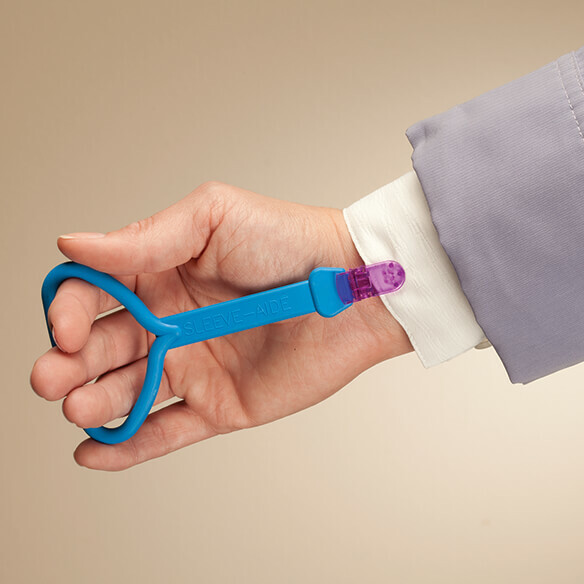 Perfect for anyone with limited dexterity, the easy-flip sleeve holder gently grips your shirt cuff to avoid bunching. Simply slide fingers through the flexible rubber loop, clip on sleeve cuff, and pull on your top layer. Slim design makes it easy to carry in your pocket or purse. Dressing stick measures 5 3/8”L. Makes it easier to get your jacket on when you can hold a sleeve from shirt or sweater down while you put it on. Looks like a good aide- easier than trying to hold the sleeve like a five year old.